Compound butter is a quick and easy way to add intense flavor to dishes. It is particularly tasty on grilled or roasted meats or vegetables. Compound butter is just softened (room temperature) butter flavored with herbs, aromatics, spices, citrus zest, cheese, or other flavorings. Try one of the compound butters below or experiment with your own combinations. In all cases, bring butter to room temperature and then combine it with the flavorings by pulsing everything in a food processor or simply mashing it with a fork in a wide bowl so you have room to really work the flavorings into the butter. Beurre Maître d'Hôtel is the mother of all flavored butter and a French classic. It is traditionally served as a pat on top of a hot steak. It's equally good on roast chicken, mashed potatoes, and grilled vegetables. 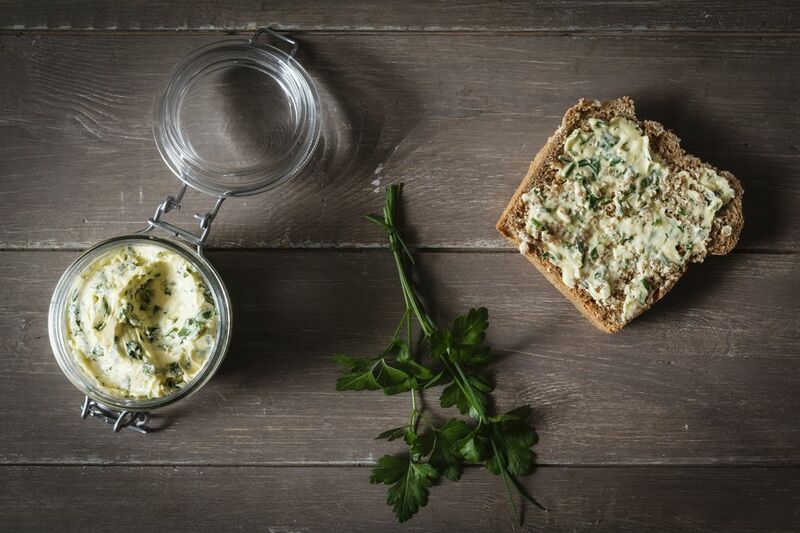 Beurre Maître d'Hôtel Recipe: Combine 1/2 cup butter with 1 tablespoon minced parsley and 1 teaspoon fresh lemon juice. Add fine sea salt and freshly ground black pepper to taste. Avocado Butter is a rich mixture that is particularly fine on salmon or other fish. Avocado Butter Recipe: Mix 1/2 cup butter with 1 peeled and pitted avocado. Add a clove of ​minced garlic, 1 to 2 teaspoon lime juice or lemon juice, and fine sea salt to taste. Basil Butter is wonderful on chicken or fish. 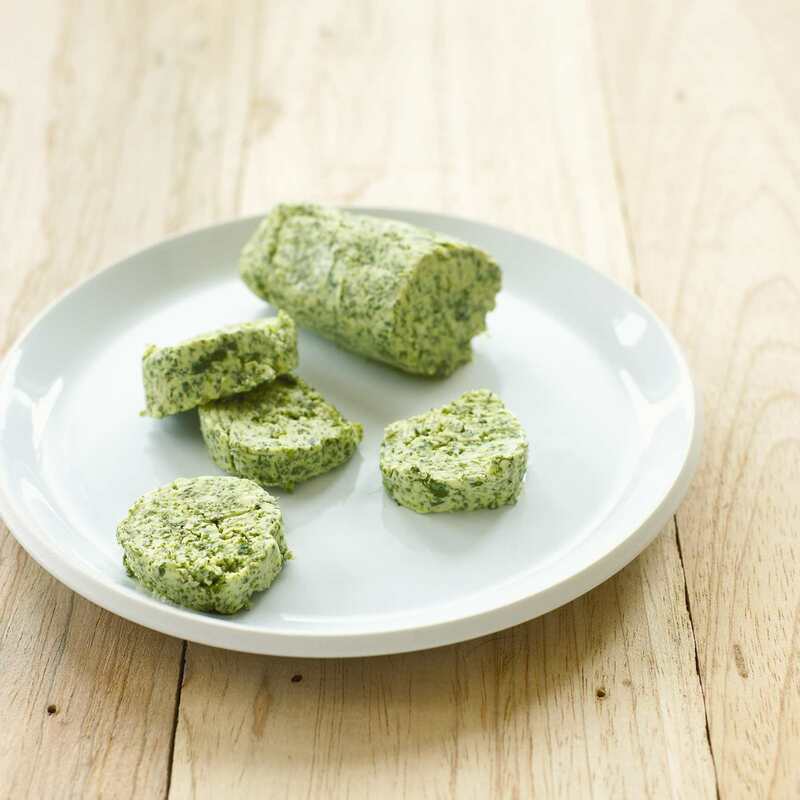 Basil Butter Recipe: Use about 1/2 cup chopped fresh basil leaves for every 1/2 cup butter. Add a clove of minced garlic, if you like, and/or a grating or two of lemon zest as well as fine sea salt to taste. Cilantro Lime Butter works on meats of all kinds, but also fish and corn. Cilantro Lime Butter Recipe: For each 1/2 cup of butter, use 2 or 3 tablespoons chopped cilantro leaves, and 2 teaspoons lime zest. Add a bit of green chile sauce (or green Tabasco) if you're so inclined. Garlic Butter can be used to make garlic bread or garlic toast but is also very good on top of a steak. Lemon-y Butter is delicious on chicken or fish or, perfection on grilled asparagus (pan-roasted asparagus is good too). Lemon-y Butter Recipe: Combine 1/2 cup butter with 1 teaspoon fresh lemon juice and 1 tablespoon freshly grated lemon zest (just the yellow part of the peel, being sure to avoid the bitter white pith beneath when you grate). Blue Cheese Butter is divine on freshly grilled or broiled steaks. Blue Cheese Butter Recipe: Use about 1/2 cup butter and 2 ounces blue cheese (such as Roquefort). Dress it up a bit more by adding a minced shallot, a splash of red wine vinegar, or a bit of fresh thyme. Make the Best Doughnuts Ever at Home!